In the Distilled R&D department we have been ramping up the amount of automated monitoring and analysis we do, with an internal system monitoring our client’s sites both directly and via various data sources to ensure they remain healthy and we are alerted to any problems that may arise. Recently we started work to add in functionality for including the rel-alternate-hreflang annotations in this system. In this blog post I’m going to share an open-source Python library we’ve just started work on for the purpose, which makes it easy to read the hreflang entries from a page and identify errors with them. If you’re not a Python aficionado then don’t despair, as I have also built a ready-to-go tool for you to use, which will quickly do some checks on the hreflang entries for any URL you specify. Google’s Search Console (formerly Webmaster Tools) does have some basic rel-alternate-hreflang checking built in, but it is limited in how you can use it and you are restricted to using it for verified sites. return tag errors – Every alternate language/locale URL of a page should, itself, include a link back to the first page. This makes sense but I’ve seen people make mistakes with it fairly often. indirect / broken links – Links to alternate language/region versions of the page should no go via redirects, and should not link to missing or broken pages. multiple entries – There should never be multiple entries for a single language/region combo. multiple defaults – You should never have more than one x-default entry. conflicting modes – rel-alternate-hreflang entries can be implemented via inline HTML, XML sitemaps, or HTTP headers. For any one set of pages only one implementation mode should be used. polly is the name for the library we have developed to help us solve this problem, and we are releasing it as open source so the SEO community can use it freely to build upon. We only started work on it last week, but we plan to continue developing it, and will also accept contributions to the code from the community, so we expect its feature set to grow rapidly. If you are not comfortable tinkering with Python, then feel free to skip down to the next section of the post, where there is a tool that is built with polly which you can use right away. Get more instructions and grab the code at the polly github page. Hit me up in the comments with any questions. Example output from the ninja! 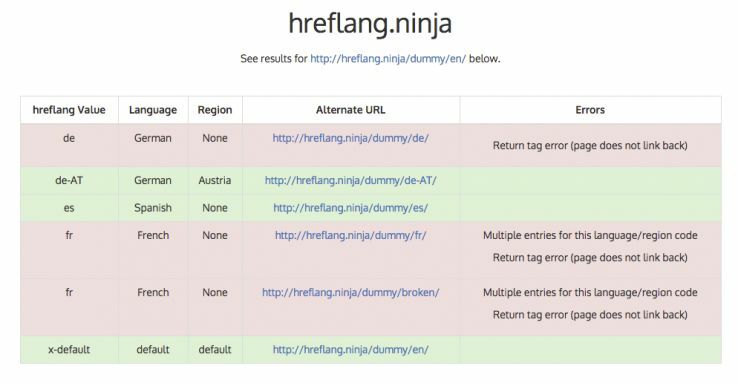 The tool shows you the rel-alternate-hreflang entries found on the page, the language and region of those entries, the alternate URLs, and any errors identified with the entry. It is perfect for doing quick’n’dirty checks of a URL to identify any errors. As we add additional functionality to polly we will be updating hreflang.ninja as well, so please tweet me with feature ideas or suggestions. This is the first release of polly and currently we only handle annotations that are in the HTML of the page, not those in the XML sitemap or HTTP headers. However, we are going to be updating polly (and hreflang.ninja) over the coming weeks, so watch this space! With the increasing number of SEO directives and annotations available, and the ever-changing guidelines around how to deploy them, it is important to automate whatever areas possible. Hopefully polly is helpful to the community in this regard, and we want to here what ideas you have for making these tools more useful – here in the comments or via Twitter.